Home › Bible › Pope doubts visions – but where will it all end? Pope doubts visions – but where will it all end? ‹ Did Jesus Talk about Homosexuality? Samuel was correct. Nothing but attacks on Christianity. Paulus: nothing but attacks on Islam. Hypocrisy. Lol, Lassie barks and complains but never actually responds to the issue at hand. What can we expect from a rabid anti-Islamic hate mongerer? Hey Lassie, did the holy spirit yell you where I’m from yet? Hint again: it’s not Australia. My “attacks” as you call them are only attempts to use your own standards applied to Islam. Be that scholarship, argumentation etc. Because you never apply or allow the same principles to be applied to your own new faith. It would be nice to see you actually engage in deep and meaningful conversation rather than moderating people and using cheap polemics when questioned. Paulus: ‘cheap polemics’ perfectly describes your activity on this blog. Every time. What do you call this post then? Academic inquiry? Genuine discussion starter? It’s a wry look at some topical news. Paulus: you don’t like my blog? Go somewhere else. No one (least of all me) is forcing you to lurk here. are you the same paulus who got banned from here? Gentile dogs like you don’t fit the bill. Your only purpose here is to demonize Muslims. You even have a problem with Muslims sitting on the ground! Why would I treat such a person with respect? So your intention is to only insult *some* Christians. Right, got it. Oh Lassie, do you have anything constructive to add for once or will you continue to deflect from your failures? Demonise Muslims? Talk about exaggerated rhetoric. But hey, if criticising your faith is demonising, so be it. By all means sit on the ground. I simply found it pathetic that your scholars need to justify it. That is what the Sunna does to otherwise normal people. Suddenly they need to defend the physiological and spiritual benefits of sitting on the ground- simply because they emulate a man. It’s hilarious and tragic all at the same time. The problem with these so-called “visions” is that they have purportedly happened before in other places, yet they never offer any practical advice or warnings. I have heard that some Rwandan children had visions of violence in the 1980s. Naturally, some Christians believe these visions were a “warning” of the Rwandan genocide. My question would be why didn’t the Madonna actually make clear warnings? Why were these “visions” no different than the alleged “visions” of Nostradamus, which he then wrote down in deliberately cryptic prophecies? Sounds like a con to me. Or maybe these people are just hallucinating. Or maybe, just maybe, it is the work of the devil. Why not? These “visions” lead people to literally worship the Madonna. I think Satan would be happy with that. i don’t know which vision you are referring to , but can you tell me any prophet in the torah who was blinded for more than 1 day and needed to be carried away? I cannot understand how this post is critical of Paul for having a heavenly vision when Islam claims the same thing for Muhammad. For instance the hadith where Muhammad is told to pray five times a day. Paul simply had a vision from God which is quite acceptable and God ordained (Number 12:1-8). Paul never had the types of symptoms Muhammad had during his episodes. If you reject Paul for having a vision then you have to reject Muhammad many times over. Why believe one man who had these types of experiences? Um, your question doesn’t make any sense. You obviously don’t believe Muhammad’s visions and yet you’re asking why we would reject Paul’s visions? Well,for one thing, the accounts of Paul’s visions are contradictory. Why should we believe them? My comments make perfect sense. The original post casts doubt over Paul on the basis of him having a vision. Paul’s accounts of his calling are not contradictory though this changing the question. Why didn’t your prophet Paul substantiate his authority as an apostle to the orignal disciples by that vision!? Why didn’t he tell them as he wrote that he had taken the knowledge from the heveanly Jesus not like them from the earthly one? Also, why are there contradictions in your bible about that vision, and how it happened in book of acts? Also, why is it impossible for anyone among christians to claim that he takes the knowledge from the heavenly Jesus? Why is it only Paul who has this right? Paul’s “vision” was not really a vision. All he saw was a blinding light and heard a voice that claimed to be Jesus. Very different from any of the prophets in the Tanakh. “Demonise Muslims? Talk about exaggerated rhetoric. But hey, if criticising your faith is demonising, so be it. Lol, look at how this mook makes excuses for his behavior and then to finish off, makes another idiotic rant against Islam. What else can we expect from a rabid hate mongerer? So Lassie, anything constructive to add? Why don’t you ask the holy spirit? Rotfl!! Oh this is too funny! Lassie, you are very deluded dear boy! Holy Spirit fail yet again! I will continue to insult morons like you, thank you very much. If it’s too much for you, then go cry to someone who cares. Maybe if you lose your rabid anti-Islamic hate mongering, you would be worthy of a normal conversation. But I know that’s impossible. You are an idiot with whom a rational conversarion is an impossibility. I mean look at you. You are still convinced that I’m from Australia! I’ve never even been anywhere near Australia, you ding bat. But, believe what you will if it makes you happy. It makes it easier for me to embarrass you. By all means continue the insults. All it does it turn people away from listening to you, and the religion you follow. After all, why would anyone want to be a muhammadan if your behaviour is the result? And it allows everyone following Bilal’s blog to see the hypocrisy of Islam as he allows people like you free reign while he moderates constructive criticism. In other words, you guys just make Islam look bad. And your own religion has some pretty dire warnings for people like you. Thanks for those words Paulus. I think we have put up with your insults and lies long enough. You have earned your just reward: you are henceforth banned. Lol, oh the irony! All this is coming from Mr. Lassie, rabid anti-Muslim hate mongerer! Too bad. I was looking forward to him finally figuring out where I live? And it ain’t Australia! The other is not – so called apparitions and appearances of Mary are all untrue and part of the problems of Roman Catholicism, which has been a heresy and false church, since the Council of Trent condemned the heart of the gospel message, falling under the anathema of Galatians 1:6-9.
what a shameless christian. the catholics gave you trinity and canon. they are the ones who are receiving visions from mother of yhwh and you dare to question those visions? No they did not – the first 5 Centuries were not Roman Catholic, and all Protestants have always believed that we are ‘catholic” also, in the sense of “universal, apostolic, and agree that the first 4 creeds/councils were Biblical. They did not give us the canon. The canon is the result of being God-breathed/inspired first century documents. Romanism / Papalism was not in existence in the first 4-5 centuries. The Eastern Orthodox are right on that also (they also know that the bishop of Rome was never meant to be “bishop over all other bishops” or “infallible”; though wrong on many other things. John Henry Cardinal Newman was wrong. Ignaz Von Dollinger and lord John Acton were correct against the infallibility dogma of 1870. Athanasius was right on many things; wrong on a few things. Cyprian was right (as also 86 other bishops from all over Empire) to oppose bishop of Rome Stephen’s claim to be “bishop over all other bishops” around 257-258 AD. Jerome was right on Apocrypha books, but wrong on Perpetual virginity of Mary. 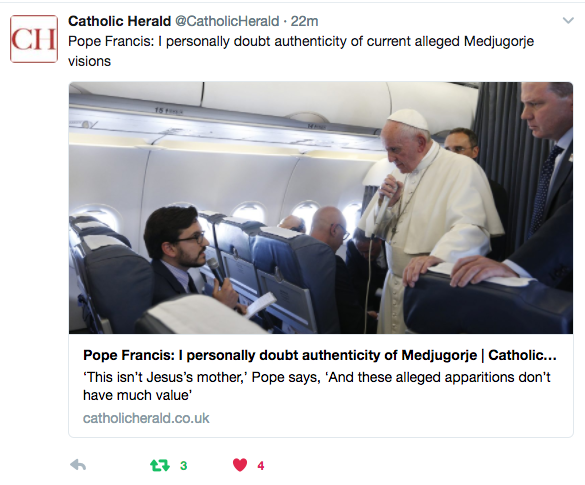 Yes, I dare and in your face say that all those apparitions are false and heretical and the only true Mary, mother of Jesus, is the Mary in the NT. One of the grossest things is the way they over-exalted her and even “worship” her, although they claim they are not worshiping her. the visions came centuries after canon was already in existence; the false doctrines, prayers to Mary, statues, icons are wrong and came centuries later; the dogmas came centuries and some millennia later (1854 – dogma of Immacute Conception; 1950 the dogma of the Bodily Assumption of Mary) Totally unbiblical, heretical, wrong, and ugly. Because of the early practices of those piety that had begun before Islam (praying to mary, icons, statues), the whole Muslim world and the Qur’an misunderstood true Christianity – Surah 5:72-78; 5:116; 6:101; 19:88-92. All of that stuff is based on false practices about Mary that slowly began after 340s into 600s AD. Your whole religion of Islam got “Son of God” wrong and got the Trinity wrong because of the false Marian practices and piety of late 300s into 600s AD. But no dogmas about her were in existence then, except that she was a true virgin before Jesus was born (Matthew 1:18-25, Luke chapters 1-2) and the Theotokos of Council of Ephesus in 431 AD (and to Chalcedon in 451 AD) was meant to be about Jesus as Deity from conception in the womb of Mary – it was not about her so much as about Jesus. Roman Catholics of the 800s AD to 2017 AD are not the same people as the first century Christians or 2nd or 3rd or 4th or 5th century Christians. It is silly and stupid to project 18 and 19th and 20th century apparitions of Mary onto believers in the first 5 centuries. That is called “anachronistic”. mary is the wisdom /sophia which carried yhwh in her womb. the yhwh carrier carried 1 person, 2 natures. all those appearances are genuine according to the catholics. they touch her, communicate with her and even see her moving about. what a lie, catholicism has its roots in 1st century judaism. the catholics genuinely believe this . The issues are: 1. Was a Papal office of bishop over all other bishops in authority around in the first 5-6 centuries or more? NO, even the Eastern Orthodox know this. 2. Was a doctrine of Transubstantiation with it’s Aristotelian philosophy around in the first 5 centuries? No. 3. Was purgatory around in the first 4 centuries?. No. 4. Were statues and icons as part of worship context with ideas of dulia and latria? No. 5. Were prayers to Mary or statues to her or icons or doctrines or dogmas of over-exalting her in the first 3-4 centuries? No. “New Eve” was around, but by itself, it does nothing to add to the later dogmas. Theotokos of 431 – 451 AD was there, but it meant that Jesus was Deity in the womb (and before as eternal Son and eternal Word) – it was not about Mary, but about Jesus. 6. Tertullian was right against infant baptism and 7. he was right against “perpetual virginity of Mary” – only with Jerome and Augustine (400 AD) did perpetual virginity begin to be defended; and they were wrong on that. So you see, there was no Roman Catholic Church in the early centuries. “catholic” (Universal throughout the known world – Roman Empire and beyond – yes, as it was spreading out in missionary enterprise; but “Roman Catholic” – NO. The early Catholics believed that at the epiclesis the bread and wine turned into the literal body and blood of Jesus, a doctrine you reject. There were several views in the early church. Even “real presence” is not the sole view of the early centuries, and when it is clear, it is more like the Lutheran “con-substantiation” – Jesus’ presence comes, but the wine and bread still remain wine and bread. There is no “Transubstantiation” where the bread and wine cease to be bread and wine. But of course, the key is Scripture; since Jesus is still in His physical incarnational body at the Lord’s supper before the Cross even happened, when He said “this is My body” and “this is My blood”, it could not have meant what RCs anachronistically read back into it; it obviously mean “this represents My body” and “this represents My blood” – obvious symbols. you are obsessed by the word ‘transubstantiation’. Like I said, the early Catholics believed that at the epiclesis the bread and wine turned into the literal body and blood of Jesus, a doctrine you reject. So you are the heretic judging by the teaching of the Catholic church that gave you the NT. J. N. D. Kelly, writes: “Eucharistic teaching, it should be understood at the outset, was in general unquestioningly realist, i.e., the consecrated bread and wine were taken to be, and were treated and designated as, the Savior’s body and blood” (Early Christian Doctrines, 440). From the Church’s early days, the Fathers referred to Christ’s presence in the Eucharist. Kelly writes: “Ignatius roundly declares that . . . [t]he bread is the flesh of Jesus, the cup his blood. Clearly he intends this realism to be taken strictly, for he makes it the basis of his argument against the Docetists’ denial of the reality of Christ’s body. . . . Irenaeus teaches that the bread and wine are really the Lord’s body and blood. His witness is, indeed, all the more impressive because he produces it quite incidentally while refuting the Gnostic and Docetic rejection of the Lord’s real humanity” (ibid., 197–98). “Hippolytus speaks of ‘the body and the blood’ through which the Church is saved, and Tertullian regularly describes the bread as ‘the Lord’s body.’ The converted pagan, he remarks, ‘feeds on the richness of the Lord’s body, that is, on the Eucharist.’ The realism of his theology comes to light in the argument, based on the intimate relation of body and soul, that just as in baptism the body is washed with water so that the soul may be cleansed, so in the Eucharist ‘the flesh feeds upon Christ’s body and blood so that the soul may be filled with God.’ Clearly his assumption is that the Savior’s body and blood are as real as the baptismal water. Cyprian’s attitude is similar. Lapsed Christians who claim communion without doing penance, he declares, ‘do violence to his body and blood, a sin more heinous against the Lord with their hands and mouths than when they denied him.’ Later he expatiates on the terrifying consequences of profaning the sacrament, and the stories he tells confirm that he took the Real Presence literally” (ibid., 211–12). that article I linked to refutes all that. Ignatius was refuting Gnostics/Docetics who denied Jesus had a real physical body. “Having taken the bread and given it to His disciples, Jesus made it His own body, by saying, ‘This is My body,’ that is, the symbol of My body. There could not have been a symbol, however, unless there was first a true body. An empty thing or phantom is incapable of a symbol. He likewise, when mentioning the cup and making the new covenant to be sealed ‘in His blood,’ affirms the reality of His body. For no blood can belong to a body that is not a body of flesh” (Against Marcion, 4.40). Tertullian’s explanation could not be clearer. On the one hand, he based his argument against Gnostic docetism on the words of Christ, “This is My body.” On the other hand, Tertullian recognized that the elements themselves ought to be understood as symbols which represent the reality of Christ’s physical body. Because of the reality they represented, they provided a compelling refutation of docetic error. Based on Tertullian’s explanation, we have good reason to view the words of Ignatius and Irenaeus in that same light. The Didache, written in the late-first or early-second century, referred to the elements of the Lord’s table as “spiritual food and drink” (The Didache, 9). The long passage detailing the Lord’s Table in this early Christian document gives no hint of transubstantiation whatsoever. Justin Martyr (110–165) spoke of “the bread which our Christ gave us to offer in remembrance of the Body which He assumed for the sake of those who believe in Him, for whom He also suffered, and also to the cup which He taught us to offer in the Eucharist, in commemoration of His blood“(Dialogue with Trypho, 70). Clement of Alexandria explained that, “The Scripture, accordingly, has named wine the symbol of the sacred blood” (The Instructor, 2.2). Origen similarly noted, “We have a symbol of gratitude to God in the bread which we call the Eucharist” (Against Celsus, 8.57). Cyprian (200–258), who sometimes described the eucharist using very literal language, spoke against any who might use mere water for their celebration of the Lord’s Table. In condemning such practices, he explained that the cup of the Lord is a representation of the blood of Christ: “I marvel much whence this practice has arisen, that in some places, contrary to Evangelical and Apostolic discipline, water is offered in the Cup of the Lord, which alone cannot represent the Blood of Christ” (Epistle 63.7). For with the wine which was indeed the symbol of His blood, He cleanses them that are baptized into His death, and believe on His blood, of their old sins, washing them away and purifying their old garments and vesture, so that they, ransomed by the precious blood of the divine spiritual grapes, and with the wine from this vine, “put off the old man with his deeds, and put on the new man which is renewed into knowledge in the image of Him that created him.” . . . He gave to His disciples, when He said, “Take, drink; this is my blood that is shed for you for the remission of sins: this do in remembrance of me.” And, “His teeth are white as milk,” show the brightness and purity of the sacramental food. For again, He gave Himself the symbols of His divine dispensation to His disciples, when He bade them make the likeness of His own Body. For since He no more was to take pleasure in bloody sacrifices, or those ordained by Moses in the slaughter of animals of various kinds, and was to give them bread to use as the symbol of His Body, He taught the purity and brightness of such food by saying, “And his teeth are white as milk” (Demonstratia Evangelica, 8.1.76–80). Augustine (354–430), also, clarified that the Lord’s Table was to be understood in spiritual terms: “Understand spiritually what I said; you are not to eat this body which you see; nor to drink that blood which they who will crucify me shall pour forth. . . . Although it is needful that this be visibly celebrated, yet it must be spiritually understood” (Exposition of the Psalms, 99.8). He also explained the eucharistic elements as symbols. Speaking of Christ, Augustine noted: “He committed and delivered to His disciples the figure [or symbol] of His Body and Blood.” (Exposition of the Psalms, 3.1). And in another place, quoting the Lord Jesus, Augustine further explained: “‘Except ye eat the flesh of the Son of man,’ says Christ, ‘and drink His blood, ye have no life in you.’ This seems to enjoin a crime or a vice; it is therefore a figure [or symbol], enjoining that we should have a share in the sufferings of our Lord, and that we should retain a sweet and profitable memory of the fact that His flesh was wounded and crucified for us (On Christian Doctrine, 3.16.24). ” The Lord Jesus, in the discourse which He addressed to His disciples after the supper, when Himself in immediate proximity to His passion, and, as it were, on the eve of departure, and of depriving them of His bodily presence while continuing His spiritual presence to all His disciples till the very end of the world….” (Augustine, John: Tractates 50, 92, 102, and 118). “This is then to eat the meat, not that which perishes, but that which endures unto eternal life. To what purpose do you make ready teeth and stomach? Believe, and you have eaten already. ” (Augustine John: Tractate 25:12). Many Catholics and non-Catholics alike think that the Roman Catholic Church invented the doctrine of transubstantiation. Transubstantiation means that the bread and wine presented on the altar at the Mass become the the Body and Blood of Christ by the power of the Holy Spirit at the consecration. The consecration is the time when the priest calls upon the Holy Spirit to change the bread and wine into Christ’s Body and Blood. However, the Body and Blood retain the appearance of bread and wine. The Roman Catholic Church, that is, the Latin Rite Catholic Church, and other Catholic Churches in communion with Rome believe that the Eucharist is the Real Presence of Jesus Christ, body, blood, soul and divinity. The Orthodox Churches and most other Churches of the East do so as well. Anglican [Episcopalian] and other Protestant denominations have interpreted Christ’s presence at the celebration of the Lord’s Supper or Eucharist to be either only spiritual, or symbolic, or non-existent. Thus, I decided to research what the Early Christians believed on this issue. I searched the indices for “Eucharist” in many volume sets on Early Christian writings, and I was astonished at my discovery. The Early Christians actually took the Real Presence for granted. It doesn’t even seem as if there was much debate. I could not find anyone who denied the Real Presence of Our Lord in the Blessed Sacrament before the year 500 A.D. Following are the results of my search. Some Christians, e.g. St. Augustine, had very much to say about the Real Presence of Our Lord, so I did not include everything. Also, I want you to know that I did not include other Christians who believed in the Real Presence in this article because they later fell away from the Church for different reasons. Therefore, even though these Christians defended the Real Presence, e.g. Origen, Tertullian, Theodore of Mopsuetta, etc., I did not include their statements. I pray that this research article will inspire lukewarm Catholics to become excited about their Faith which has faithfully been passed on for over 2000 years. I pray that the Holy Spirit will grant you Faith to believe in Our Lord in the Blessed Sacrament and to receive Him at Mass and visit Him in the tabernacle. He is patiently waiting for you because he loves you and wants you to come home. Also, I pray that this research article will motivate non-Catholics to ask questions about the Blessed Sacrament to learn more. Our Lord is still with us in the flesh, and He is awesome! I pray that someday you will be able to experience the joy of receiving Him in the Mass and of praying at his feet. The Didache or “The Teaching of the Twelve Apostles” is a manuscript which was used by 2nd century bishops and priests for the instruction of catechumens. Many early Christian writers have referenced it making this document relatively easy to date. “Let no one eat and drink of your Eucharist but those baptized in the name of the Lord; to this, too the saying of the Lord is applicable: ‘Do not give to dogs what is sacred'”. St. Ignatius became the third bishop of Antioch, succeeding St. Evodius, who was the immediate successor of St. Peter. He heard St. John preach when he was a boy and knew St. Polycarp, Bishop of Smyrna. Seven of his letters written to various Christian communities have been preserved. Eventually, he received the martyr’s crown as he was thrown to wild beasts in the arena. -“Five Books on the Unmasking and Refutation of the Falsely named Gnosis”. Book 4:18 4-5, circa 180 A.D. Description of an event in which an infant was taken to a pagan sacrifice and then the mother recovered it and brought it to Mass. -“On Joel 2:24”, Commentaries on Sacred Scripture, Vol. 2 p. 252 of the Assemani edition. “`I have received of the Lord that which I also delivered unto you, that the Lord Jesus, the same night in which He was betrayed, took bread, etc. [1 Cor. 11:23]’. This teaching of the Blessed Paul is alone sufficient to give you a full assurance concerning those Divine Mysteries, which when ye are vouchsafed, ye are of (the same body) [Eph 3:6] and blood with Christ. For he has just distinctly said, (That our Lord Jesus Christ the same night in which He was betrayed, took bread, and when He had given thanks He brake it, and said, Take, eat, this is My Body: and having taken the cup and given thanks, He said, Take, drink, this is My Blood.) [1 Cor. 2:23-25] Since then He Himself has declared and said of the Bread, (This is My Body), who shall dare to doubt any longer? And since He has affirmed and said, (This is My Blood), who shall ever hesitate, saying, that it is not His blood? “Contemplate therefore the Bread and Wine not as bare elements, for they are, according to the Lord’s declaration, the Body and Blood of Christ; for though sense suggests this to thee, let faith stablish thee. Judge not the matter from taste, but from faith be fully assured without misgiving, that thou hast been vouchsafed the Body and Blood of Christ. St. Hilary firmly defended the Nicene Creed against Arian false doctrines. He was ordained Bishop of Poiters in 350 A.D. His efforts led to the collapse of Arianism in the West. He was proclaimed a Doctor of the Church by Pius IX in 1851. -“The Trinity” [8,14] inter 356-359 A.D.
St. Basil is recognized as the founder of Eastern monasticism. He was ordained Bishop of Caesarea in 370 A.D. He defended the Catholic Church against two waves of Arian attacks. The first movement denied the divinity of Christ. The second denied the divinity of the Holy Spirit. He is considered one of the greatest saints of the Oriental Church. -“Concerning Baptism” Book I, Ch. 3. -“Letter to a Patrician Lady Caesaria”  ca. 372 A.D.
-“The Man Well-Anchored”  374 A.D.
St. Gregory was consecrated Bishop of Sasima in the year 371 A.D and was a friend of St. Basil for most of his life. -“Letter to Amphilochius, Bishop of Iconium”  ca. 383 A.D.
-“Orations and Sermons” [Jaeger: Vol 9, p. 287] ca. 383 A.D.
-“Orations and Sermons” [Jaeger Vol 9, pp. 225-226] ca. 383 A.D.
From 386-397 A.D. St. John Chrysostom served as a priest in the main church of Antioch. He soon became renown for his preaching and writing skills. In 397 A.D. he succeeded St. Gregory of Nazianz as Bishop of Constantinople. -“Homilies on the Gospel of Matthew” [82,4] 370 A.D. Source: St. John Chrysostom, “Homilies on the Second Epistle to Timothy,” 2,4, c. 397 A.D.
-“Homilies on the First Letter to the Corinthians” [24,1] ca. 392 A.D.
-“The Sacraments” Book 4, Ch.4:14. -“Letter to Horontianus” circa 387 A.D.
-“Diary of a Pilgrimage” Ch. 35. Describes a Mass held in front of Mt. Sinai. -“Diary of a Pilgrimage” Ch. 3. -“Hymns for Every Day” Hymn 170. -“Commentaries on the Gospel of Matthew” [4,26,26] 398 A.D.
“He who made you men, for your sakes was Himself made man; to ensure your adoption as many sons into an everlasting inheritance, the blood of the Only-Begotten has been shed for you. If in your own reckoning you have held yourselves cheap because of your earthly frailty, now assess yourselves by the price paid for you; meditate, as you should, upon what you eat, what you drink, to what you answer ‘Amen'”. “For the whole Church observes this practice which was handed down by the Fathers: that it prayers for those who have died in the communion of the Body and Blood of Christ, when they are commemorated in their own place in the sacrifice itself; and the sacrifice is offered also in memory of them on their behalf. Source: St. Augustine, Sermons 172,2, circa 400 A.D.
“The fact that our fathers of old offered sacrifices with beasts for victims, which the present-day people of God read about but do not do, is to be understood in no way but this: that those things signified the things that we do in order to draw near to God and to recommend to our neighbor the same purpose. A visible sacrifice, therefore, is the sacrament, that is to say, the sacred sign, of an invisible sacrifice… . Christ is both the Priest, offering Himself, and Himself the Victim. He willed that the sacramental sign of this should be the daily sacrifice of the Church, who, since the Church is His body and He the Head, learns to offer herself through Him. -“Apocriticus” [3,23] ca. 400 A.D.
-“Sermons” [91,3] ante 461 A.D.
Can you show me in the NT a church office called “priest”? Where in the NT is anything about calling upon the HS to change the wine into blood and bread into the body of Christ? NB Acts does not claim to be inspired scripture and I see no evidence Luke thought he was writing scripture. Does not matter how you try to interpret Luke’s intension. both Luke’s gospel and the book of Acts are God-breathed Scripture -2 Timothy 3:16; 1 Timothy 5:18 – he even puts Luke’s gospel on same par as holy Scripture as the torah by quoting Deut. and Luke 10:7/Matthew 10:10. All Christians have always believed this. Acts 1:1-8 shows this, and connects the book to the gospel of Luke, which is intended to show both the teachings and actions of Jesus that He began to do and teach while alive, and which continue through the apostles and early church by the Holy Spirit, and shows the unity of the Holy Spirit and Jesus the eternal Son working spiritually through the apostles and early church of the first century. “All that Jesus began to do and teach” – the verb tense is significant there. Which one? The one who knows Jesus is “divine son of God” or the one who doesn’t? There are no contradictions once you study them deeply and properly in context, etc. He did just that (shared his experience with the risen Jesus and confirmed with each other that they preached the same gospel) when he went and visited Peter, James, and then the rest of the disciples in Galatians chapters 1-2 and they approved of his gospel. James was an enthusiastic follower of the Law. Paul was not. Why was this? What are you saying man!? Those 2 chapters mentioned quite the opposite! He didn’t mention to them (((that vision))) , which is the source of his message! He was so arrogant, and he even cursed them. He was trying to correct the Rock of Jesus’ church! How satanic that man when he lied to Galatian people about his meeting with the original disciples! He didn’t mention that he was just a hypocrite ( as the book of acts mentioned) in front of the original disciples! If there’s a disagreement between them, Paul should have said ” I’m an apostle—not from men nor through man, but through Jesus Christ and God the Father, who raised him from the dead” or “For I would have you know, brothers, that the gospel that was preached by me is not man’s gospel. I received my message from no human source, and no one taught me. Instead, I received it by direct revelation from Jesus Christ”, yet he couldn’t say that since he’s a liar, and he knew it. If the message he got from the heavenly Jesus, there’s no need for his message to be approved by the original disciples. And who are those (((held in high esteem))) who can reject the message of Paul that he received from the heavenly Jesus? No idea why you didn’t answer the rest of my questions! It is obvious that the apostle Paul is saying that he got direct revelation from the risen first, then later went and visited the disciples and James, who were eyewitnesses with Jesus when Jesus was alive and crucified and resurrected ( 1 Corinthians 15:3-11, etc.) and then when he explained the vision (that is recorded in Acts 9, 22, 26) to them in Galatians 1, and 2, they all agreed that they all were preaching the same message and they confirmed one another. It’s amazing that the very man who once said that ‘free style of transmission is the (best) way to preserve an ancient text’ tries desperately to return the text to its original language to understand what those texts exactly say! Why did he blame Bart then? Why would Jesus speak to Paul in Hebrew? It seems you read another book! “And the leaders of the church had nothing to add to what I was preaching. (By the way, their reputation as great leaders made no difference to me, for God has no favorites. )” !!! Well , mr Paul! Those people were with Jesus from the beginning, and that makes a big difference! One of them is the Rock even ! Paul with no doubt was lying in that letter, which you consider ironically “the word of God”, to Galatians. i find it funny how a guy who believes a woman brought out 1 person , 2 natures is talking about marian veneration. you mean they trust her human nature more than her divine one? okay, so you are alright with worshipping a random unrecognisable man with holes in his hands and feet? icons, statues ? who told you that they worship/pray to the icons, statues? do you pray to the flesh of jesus? Jesus is eternal God the Son, the word who became flesh/human through the virgin Mary, and God the Son and worthy of worship; and Mary and angels and other dead saints are not suppossed to be worshiped or prayed to or venerated with dulia or hyperdulia. Period. this is idolatry and you are a hypocrite for accusing the catholics of idolatry. jesus eat, and needed oxygen even when performing miracles. you are a hypocrite and your words are those used by people who worship human beings. you took her son to another level, but you didn’t take the mother who looked after yhwh to another level, why not? forget your “Scripture” and use common sense and ask, why take a BREATHING and eating thing to another level? isn’t A2 completely redundant ? you have a CREATED god AND an INVISIBLE god being CARRIED? they are BOTH 1 person? It is amazing that you don’t get it. Your other stuff, Mr. Heathcliff, your way of argumentation, is stupid and dumb. but then it is like the author of revelations is a hypocrite. he warns against idolatry , but allows the worship of a jew who eat and slept. Behold, I am coming quickly. Blessed is the one who keeps the words of prophecy in this book.” 8And I am John, the one who heard and saw these things. And when I had heard and seen them, I fell down to worship at the feet of the angel who had shown me these things. 2500 years and still counting…. why do you have problem with catholics when jews called your god out for his blasphemy and idolatry? you just as hypocrite as jesus and the catholics. does this mean that they thought that it was BLASPHEMOUS for them to accept that INVISBLE god BECAME created and visible? Faiz and Paulus were on the same level so I don’t see why one should get banned and the other not. A bit of invective spices things up. Without the likes of Paulus I personally will not find this blog worth visiting. I think the likes of Paulus, Kev, and Shamoun constantly antagonize and insult Muslims and Islam with the intentional aim to drag the conversation into the mud, where they feel they have an even footing. It is not productive for anyone, and makes it hard to have an intelligent conversation that is beneficial for all involved. Their single minded hatred does not allow them to do anything other than attack Islam at every opportunity. They constantly rehash old arguments that have been refuted ad nausem and never move forward in the dialogue. Their strategy seems to be to defend Christianity by specifically derailing the conversation and deflecting any valid criticism by rabidly attacking Islam. Such a tiresome approach is unbecoming and entirely unproductive. We know that there are Christians and Jews who are willing to have a more polite, respectful and intellectual conversation and those are the people we should be dialoguing with, since they carry more influence and clout within their own respective communities. I think we would all like to see a more academic, scholarly, and adult conversation from which we can all benefit and learn from, inshallah. Then this blog is not for you Madman. Such a tiresome approach is unbecoming and entirely unproductive. LOL, so notice how you madman doesn’t actually condemn Paulus’ rhetoric against, but seems to be flabbergasted as to why he was banned. Now, truth be told, I don’t want him banned, but it’s brother Paul’s blog so it’s up to him. But the fact that madman doesn’t actually find anything wrong with Paulus’ “invective” really speaks volumes. This is why there is no reason to hold back against these chumps. This is all they understand. A rational conversation is not possible with these people. Now madman, instead of wasting time with pointless posts, why not actually deal with the issue at hand? Why do you Christians always try to deflect? How many of my questions have you refused to answer so far? Do you enjoy embarrassing yourself by opening your mouth and then running away like a coward when you’re confronted? Amazing how you don’t comprehend passages like Romans 7:12 or 1 Timothy 1:8-11 and make statements like above. Paul most likely did not write 1 Tim. Amazing how you don’t comprehend that your own scholars know that and make statements like above. Even so (putting aside the authorship of 1 Timothy for the moment), Romans 7:12 is clear, as is Romans 13:8-14; Romans 1:32; 2:12-16 and 3:31 are clearly among many passages of the apostle Paul’s positive take on the law of God. They are not “my scholars”. You should at least say, “some scholars” or “most modern scholars”, in order to be honest and intellectual. James lived under the Law, Paul did not. Why? Brilliant stuff again, brother ken. I have been visiting this blog for sometime now and really pray that our Lord and Saviour Jesus Christ reveal himself to our lost Muslim brothers. Sort of feel sorry for Paul Williams as he’s badly struggling to refute your posts. “Badly struggling”? What planet are you living on? Anyone who is familiar with Ken’s tactics knows that he basically ignores anything that refutes him and simply responds with “nope, you’re wrong”. That might impress gullible Christians, but the rest of us are certainly not impressed. Paul has a few other such moments in the letter where he seems to be backpedaling. By the force of his excitement to preach the gospel, perhaps Paul ran ahead of himself. And so Paul finds himself having to defend God against that charge. His hand is forced by the resurrection of Jesus and he has to work it through—sometimes more clear and compelling, sometimes less so. btw that quote came from an evangelical christian .